This morning, after all the rain of last night, I realized that I really should bring my good camera every time I leave the house. You can find beauty everywhere, and a cell phone camera does not always do it justice. For a blog posting, I'd say this is fine, after all, it is shrunk down to the size of a "standard def" TV screen. The fog that is in the picture is probably due to the junk that the lens gets on it from riding around in my left pocket. There was a lot of rain last night. My pool is filled somewhat, my yard watered although the sprinklers kicked in which means the orchids got their water. The streets were cleared of the dust that collects and everything had jewels that sparkled in the early morning light. At the midpoint of this morning's walk, Lettie stopped to sniff yet-another-interesting-smell and I looked up. 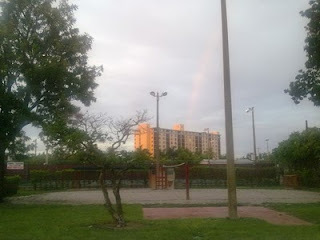 There was a full rainbow. The end of the rainbow happened to be at the middle of the roof of the Wilton Towers, and the other side was towards the Wilton Drive. Some might say that it is redundant, rainbows over Wilton Manors. Others say it is a good omen, after all it was centered over new City Hall and the lot that used to be old City Hall. At 7AM sunrise, it was a nice moment. Nobody is up at that time of day but the dog walkers and people on bikes going through town. It is quiet. All the partiers are back at their hotels or passed out somewhere under cover. There weren't any people banging around trying to get somewhere before traffic, and the Beach Volleyball Court here more resembled a sandbox devoid of attention. One of the routines of owning a dog is that you must for their sake walk them three times a day. If your dog acts up, walk them. Mine gets three miles a day, never a problem which is saying something for a Border Collie. One of the benefits of going through that slog every day is that you get to see your own city at an intimate level that you flat out don't from inside a car. After all that is why urban police departments still perform patrols on foot. I'll remember to bring the camera more often. The "real" camera just takes better pictures.